Note: You can enter this giveaway three (3) times per e-mail address per day. Deadline is 11:59PM ET 8.21.18. Whether you’re mad about macaroni or crazy for cavatappi, the Rachael Ray Cucina Pasta Pot will help you make any pasta meal even easier. 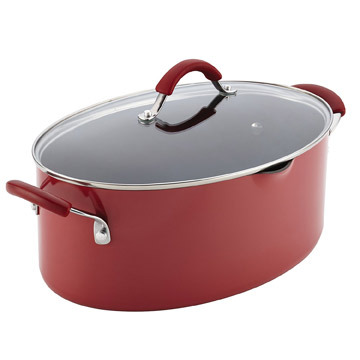 The 8-quart pot is large enough to boil lasagna noodles intact and features a helpful pour spout making it easy to drain whatever you’re cooking. The aluminum construction is durable and promotes fast, even heating and the glass lid allows you to watch what you’re cooking. It’s oven safe up to 400 degrees and the non-stick interior makes it a perfect pot for making crowd-pleasing amounts of Mushroom Macaroni and Cheese or even Chicken and Dumplings. NO PURCHASE NECESSARY TO ENTER OR WIN. Void where prohibited by law. Open to legal residents of the 50 U.S., D.C. and Canada (excluding Quebec) who are at least eighteen years old at the time of entry and have internet access. Begins on 6.25.18 at 12:00:00 a.m. ET and ends on 8.21.18 at 11:59:59 p.m. ET. To enter the giveaway, submit your full name and email address on this form. Odds of winning this giveaway depend on the total number of eligible entries received. Only three (3) entries per email address per day. Sponsored by Leite’s Culinaria, Inc. For more information, visit our Official Rules. For a list of winners, check out our Very Happy Winners page. Be sure to add giveaways@leitesculinaria.com to ensure notification if you are the winner.